Summer time --and the living is easy. 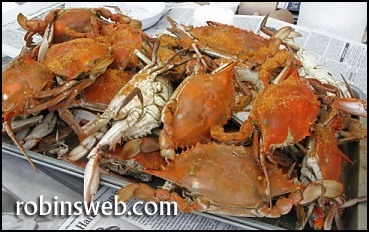 ...see How to pick a Maryland blue claw crab! It's a perfect summer night to hang out with friends in the back yard and eat crabs. Not just any old crabs, mind you, but the real thing. Chesapeake Bay Blue Claw Crabs, from the Maryland side, of course! As dusk turns to dark, all deliciously warm and muggy, the crickets are a' chirpin', the lightning bugs are blinkin', and that's what a Maryland summer's --all about. 1 cup seafood seasoning mix, such as Old Bay in the bottom pot of a double boiler-style steamer or in a large pot with a steaming rack and a tight-fitting lid, pour the water or beer and bring to a boil. Get ready with tongs or ear n heavy gloves. When the water is boiling, add the crabs to the top pan of the double boiler or to the large pot, a few at a time, Move quickly! Generously add Old Bay to the layers of crabs. Quickly cover the pan. Steam for about 15-20 minutes. We love to use Old Bay Seasoning on our crabs. If you live in an area that doesn't sell Old Bay, here's a crab recipe that you can make yourself at home. Good on all types of seafood, chicken, too! In a spice grinder or small food processor, combine all of the ingredients. Grind well and store in a glass jar.